Detail of free-motion quilting: "The Juggler"
There is still time to get one more Free-motion Quilting class under your [quilting] belt this year. Meet me at Sew 'n So Quilt Shop on Saturday, December 5. I'll be teaching my Intro to Free-motion Quilting class—bring a lunch and we'll have a good time dropping the feed dogs. 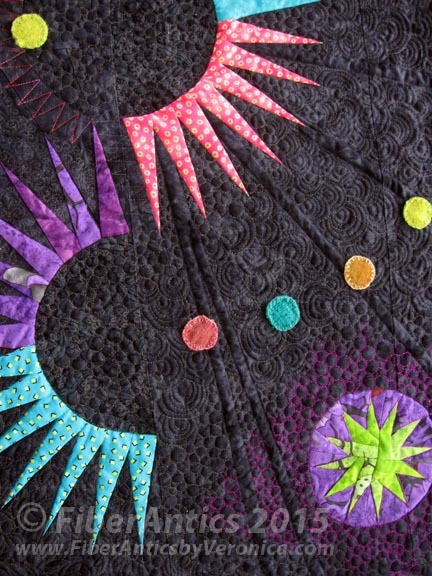 As part of this class, I bring Show and Tell of several of my pieces to provide inspiration and ideas for thread choices, quilting motifs, and whatever the class wants to know about the quilts. I think I'll bring my latest Guild Challenge piece, "The Juggler" (detail shown left) which I blogged about here and here. "The Juggler" involved 26.5 hours of free-motion quilting time and emptied 7.5 bobbins of 60 wt. thread. It's getting close to the bottom of the year when quilters are generally focused on the finishing touches on their hand-crafted gifts, attending guild holiday potlucks or planning menus for the family festivities. However, if you need a break from the holiday craziness, contact Anna at Sew 'n So Quilt Shop and tell you you want to give free-motion quilting a try. Just think of all those "quilty projects" you can get a jump start on for next Christmas!